Using data from the Helioseismic and Magnetic Imager (HMI) onboard SDO, a team of scientists were able to determine the flow velocities at a depth of 55,000 kilometers on the Sun, finding that the flow velocities of the plasma were less than a few meters per second. The interior motions of the Sun are much slower than predicted. Rather than moving at the speed of a jet plane (as previously understood) the plasma flows at a walking pace. The result of this new study, whose lead author is from the Max Planck Institute for Solar System Research, will be published in an upcoming issue of Proceedings of the National Academy of Sciences of the United States of America (PNAS). The scientists use observations of solar oscillations from NASA’s Solar Dynamics Observatory (SDO) to see into the Sun’s interior. As Laurent Gizon and Aaron C. Birch from the Max Planck Institute for Solar System Research comment in the same issue of PNAS, these new observations demonstrate the unique capabilities of helioseismology with SDO to probe the mysteries of the deep solar interior. In its outermost third, the Sun behaves like a simmering pot of water: heat from below causes the plasma to rise to the surface where it is cooled and descends back down into the interior. This mechanism, named convection, transports energy outward and controls the Sun’s structure and evolution. The scientists, led by Shravan Hanasoge from Max Planck Institute for Solar System Research, were now for the first time able to constrain the flows deep within the convection layer from direct observations of the Sun’s surface with the help of helioseismology. Helioseismology is similar to Earth seismology. “We observe oscillations of the solar surface and use them to infer properties, such as flows, in the solar interior”, explains Laurent Gizon, director of the Department “Physics of the Interior of the Sun and Sun-like Stars” at the Max Planck Institute for Solar System Research and Professor at the Institute for Astrophysics at the University of Göttingen. The team of scientists from the Max Planck Institute for Solar System Research, Princeton University, NASA’s Goddard Flight Center and New York University was able to determine the flow velocities at a depth of 55,000 kilometers, which is eight percent of the solar radius. Surprisingly, the flow velocities of the plasma were found to be less than a few meters per second. Gizon puts this into perspective saying “This is a hundred times less than predicted by numerical models of solar convection”. The key to these new results was data from NASA’s space probe SDO, which has been observing the Sun’s surface since early 2010. The scientists analyzed data from the Helioseismic and Magnetic Imager (HMI) onboard SDO. The analysis was only possible due to the combination of high resolution and full spatial coverage of the observations. The huge amount of data collected by HMI – thousands of high-resolution images of the whole Sun per day – are archived and processed in the German Data Center for SDO hosted at the Max Planck Institute for Solar System Research, a unique facility in Europe. 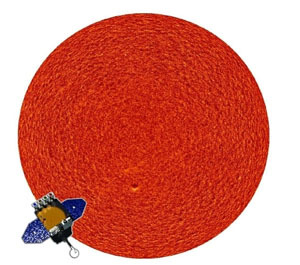 HMI measures the velocity of the Sun’s surface. When a solar acoustic wave trapped within the Sun reaches the surface, it causes the surface to move – and can thus be detected by HMI. In this way, the scientists were able to measure the time it takes for solar acoustic waves to travel from a point on the solar surface through the interior to another point on the surface. Convective flows affect the speed of propagation of the waves. Hence, it is possible to learn about the velocities of the convective flows in the solar interior from measurements of wave travel times. Modelling the interaction of solar acoustic waves with convection is a topic of current research, undertaken within the German Research Foundation’s Collaborative Research Center “Astrophysical flow instabilities and Turbulence” at the Max Planck Institute for Solar System Research and the University of Göttingen. Gizon says “The unexpectedly small velocities measured using helioseismology are the most noteworthy helioseismology result since the launch of HMI”. Adds Birch, “There is no clear way to reconcile the observations and theory”. Gizon then concludes “This result not only sheds a new light on the Sun – but also on our current inability to understand one of the most fundamental physical processes in the Sun and stars: convection”. Be the first to comment on "Unexpectedly Slow Plasma Flow Measured Below the Sun’s Surface"